Buckwheat Maple Pancakes are such a lazy Sunday morning favourite of mine. There is literally nothing better than the smell of cinnamon and maple syrup wafting through the apartment, and knowing that you’ll have breakfast in minutes is definitely a huge perk! I like to serve these with bananas, berries and coconut whip, but I must admit they taste pretty darn good with any sweet topping! 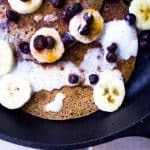 If you’re new to making vegan pancakes, these are a good recipe to start with! They’re simple and hearty, and don’t tend to stick to the pan too much. One note however: do be aware that because they’re made of buckwheat, these pancakes are a little heavier than regular fluffy ones made with white flour. Personally I think this is part of their charm and I really enjoy their heartiness. They’re balanced with brown rice flour, which is lighter and stops them from being too dense. 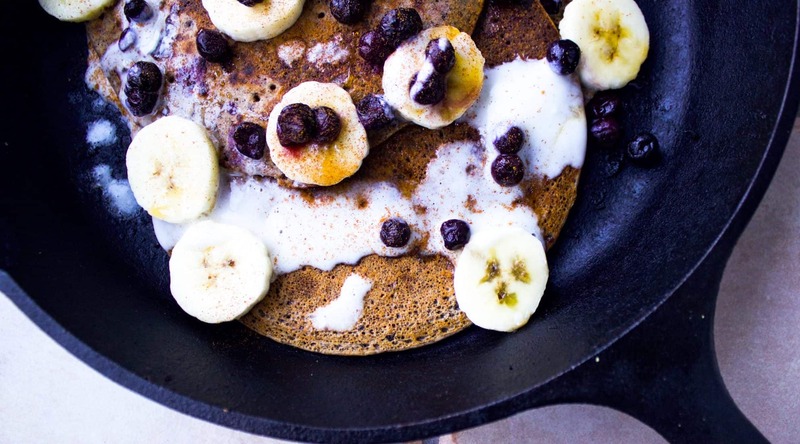 You can also customise these Buckwheat Maple Pancakes by adding your favourite toppings. I love coconut cream and fruit, but feel free to try chocolate, nuts, ice cream and anything you wish! Add in the flax seed/water mixture, maple syrup and almond milk and whisk together thoroughly (ideally using an electric whisk). Your mixture should be runny enough that it drips off the spoon. Heat a frying pan on a medium high heat and add a small amount of coconut oil on a paper towel to the pan's surface (ensure it coats the whole pan). When the oil is sizzling pour about ½ cup of pancake batter into the pan and swirl it around until the covers the bottom of the pan. Cook it for about 2-3 minutes, until brown. The flip the pancake and cook for another 2 minutes. Remove from the pan and repeat the process with the next pancake until all batter is used. 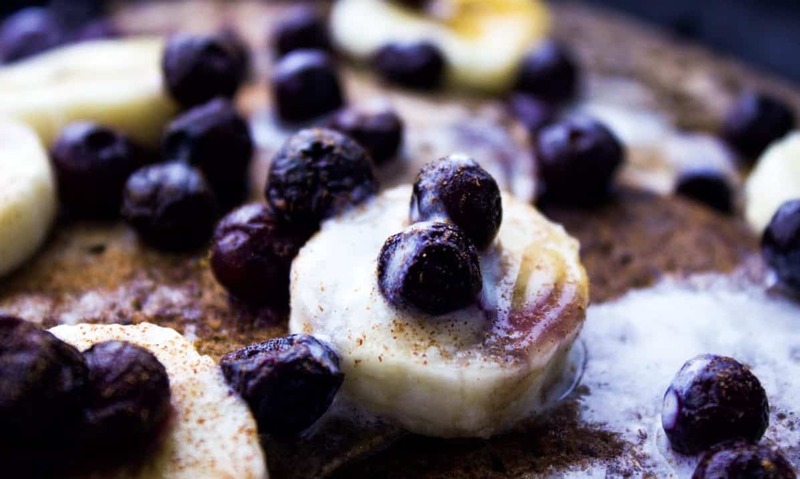 Eat the buckwheat pancakes as soon as they are cooked (or keep them warm on a plate in the oven), topped with slices of banana, berries, coconut whip and a drizzle of maple syrup! These pancakes harden up as they cool, so be sure to eat them when they're fresh from the pan!